Redesigned, patent pending hammer-fired, single stack compact pistol. Slim, one inch grip width. External hammer; feel and see gun-mode. Low effort slide with melonite finish; 27 percent less racking effort. GripZone texture for comfortable and secure hold. Hammer forged steel barrel with melonite finish. High-hand beavertail and trigger guard naturally lifts your grip to a higher, more controllable position. Double action/single action trigger. Ambidextrous thumb safety/decocker. Fiber optic front sight; low profile combat rear sight. 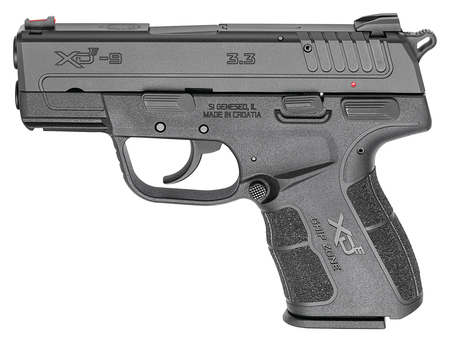 Includes 8-round flush magazine; 8-round magazine with Grip X-Tension; 9-round with magazine X-Tension. Weight: 25 ounces.